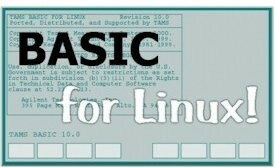 TAMS BASIC for Linux is a direct, source code port of Agilent's (HP) BASIC/UX (Rocky Mountain BASIC). Now your BASIC code can migrate to PCs running Red Hat Enterprise Linux. The current version includes CSUB support, BASIC Plus and TAMS 82091 I/O Libraries for Linux, as well as driver support for TAMS HP-IB and GPIO cards. Please contact us with any questions about migrating your BASIC system to Linux.